It looks like Marvel Studios is getting a move on with Captain Marvel. Over on Twitter, a slew of set photos from the project have hit the fandom, and the stills show off two favorite MCU characters. So, you can thank Just Jared for the juicy first-look. As you can see below, the site was able to snap photos of Captain Marvel’s first big day of production. Just Jared staked out Marvel’s filming haunts down in Atlanta to spy on the studio’s next project. Captain Marvel seems to be underway at Pinewood Studio, and two stars of the MCU were seen filming on set. Samuel L. Jackson and Colbie Smulders were snapped on set for Captain Marvel. The pair can be seen filming on a street with several cars and extras behind them. Smulders, who plays Maria Hill, can be seen pictured in a turtle neck and skinny jeans. As for Jackson, the star brought back Nick Fury without his trench coat, but the guy does have his eyepatch back. So, there is that at least. The set photos alone make it hard to gauge what time period Fury and Hill are pictured in. At San Diego Comic Con, Marvel Studios did confirm Captain Marvel will take place in the 1990s to make it the MCU’s earliest pieces chronologically. However, that does not mean part of the film’s narrative cannot take place in present day as a frame. One of the set photos shows Hill and Fury looking up to the sky where a massive green screen is hung. Maybe Captain Marvel is making her long-awaited return in the scene? Or who knows - the offender could be a Skrull just as easily. So far, Marvel Studios has yet to say anything about the start of Captain Marvel, and some fans are waiting to assign this set photos to the film until such an announcement goes live. After all, production details for the movie did say it would shoot in Los Angeles, and these snaps were taken in Atlanta. However, with Avengers 4 having wrapped earlier this month, it is hard to see why Fury and Hill would be filmed on set if it weren't for a new Marvel Studios project. When you look at the calendar, Captain Marvel is the only film that would need these characters, so it's a safe bet to say the much-anticipated film is about to get going. Now, when will fans get their first-look at Brie Larson's take on Carol, huh? 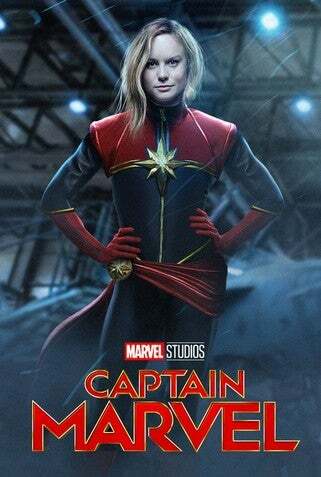 Are you excited for Captain Marvel? Hit me up on Twitter @MeganPetersCB to let me know and talk all things comics, k-pop, and anime!